A family of unique hardwood floors, hand-tooled by artisans whose craft has been passed down from generation to generation. Mannington hardwood floors are the ultimate expression of fashion sense. These floors show that you demand the best performance as well as the best design. Meticulous craftsmanship and premium selected woods, Mohawk hardwood offers you an incredible array of stylish options for your home. From rich, elegant honey tones to gentle natural hues. select from hand-scraped, distressed to classic smooth, there’s a Mohawk hardwood to fit any look you desire. With the Essential Collection you sacrifice nothing in terms of artistry and quality. Lauzon offers durability, beauty and quality affordable domestic hardwood. One of the wood flooring industry's best kept secrets, offering an outstanding collection of styles a species. Choose from 2 1/4", 3 1/4", 4" and 5" wide boards. This American made flooring offers sleek, modern, rustic or textured styles to create the space you envisioned. Made by Quick Step offers hardwood floors with Opulux. This finish creates a rich, matte surface that can easily be refreshed to help hide scuffs and scratches. It combines the luxurious visual of an oil finish with the durability and performance of a standard urethane floor. Why Mullican you ask? 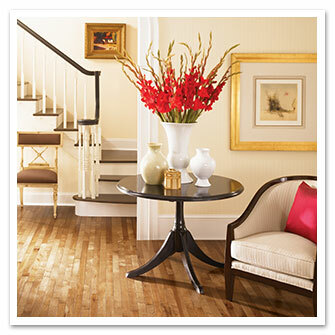 Mullican offers a comprehensive selection of pre-finished floors that are sophisticated and durable. Guaranteed to add warmth and value to your home. Choose from domestic, exotic, wire-brushed or hand-sculpted wood. Mullican offers a floor for every budget. On a budget? Dare to be different? Kraus offers unique stains and styles. Choose from a classic look to a European wide plank to dress up any room of you home. This flooring offers superior durability with a warranty to prove it. The number one selling hardwood floor. Bruce flooring is not only timeless and durable but comes in an array of rich vibrant colors. Choose from one of their many distinctive designs to create the room you dreamed of.